This is a Statement about Cornelia Rau, who was "lost" inside Australia as 'Anna', classed as an 'illegal immigrant' without any evidence for this by Department of Immigration staff, and locked away in prisons and detention centres. 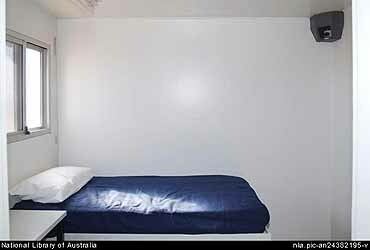 PHOTO: a bedroom in Baxter's isolation compound, where the camera (right top corner of photo) rolls 24 hours a day, and where the light does not get turned off. 'Anna' was locked away without any intervention by a court as an illegal immigrant, and made a detainee the Baxter detention centre near Port Augusta from about November last year, until she was identified as an Australian citizen in February this year, mainly as a result of the work of Pamela Curr of the Asylum Seeker Resource Centre in Melbourne with help of some others, and because journalist Andra Jackson of The Age was prepared to write a report. Detainees in the Baxter detention centre who tried to help 'Anna' wrote the statement, which was received by us at Project SafeCom. It will be sent to Mr Mick Palmer AO APM as a submission to the announced 'closed' Inquiry into the Cornelia Rau matter. It will be sent to Mick Palmer 'as is' - because identification of the writer(s) may jeopardise their treatment by guards in the Baxter centre, the outcome of their asylum claimant' cases, and decisions made by the Minister for Immigration Amanda Vanstone, because there will be no legal protection for anyone who wants to submit material to the Inquiry. NOTE: Instead of sending it to Mick Palmer, we sent the statement to the family's lawyer. An edited version of the material also appears in the New Matilda Online magazine. One day she was sobbing and crying because the floor of the room was covered by water while she was sitting in the corner of the room, holding a teddy bear, and shedding tears. Officers were told the story but they said she was "crazy and sick" and did it deliberately. Everyone knew they were wrong because when we went to have a shower in Red One the water enters your room because there are no doors. The detainees complained to the officers but were told it wasn't their business to fix the doors. Cornelia was kept in Red One Compound in one of the rooms that had no curtain. When she went to sleep she took her clothes off so that she had to put her mattress in front of the window to block the officers' view from herself. But there was a small hole and a light switch on the door. When they wanted to look into the room they turned the light on and looked through the hole but because she was naked they turned the light on for a long time to check on her. The detainees heard the officers talking about her body several times and the detainees argued with the officers to put female guards to check on her. While Cornelia was in Red One Compound they brainwashed everyone to make them believe that she had no mental problem. They said that according to the psychologists report she plays her game very well. And she's a good actress and she just pretended to be crazy because she didn't want to be deported. They said she was found with the aboriginal people and she was very dirty and dangerous. They said she was a criminal and was in prison but they didn't know about her crime if she was a smuggler, or a dealer or a murderer. In fact they made a bad picture of her in front of the detainees' minds. But the detainees who are in detention centres for more than 4 years didn't believe what the officers told them because they know the system is based on lies and everything they said was a lie so the detainees treated her nicely and respected her very much. One day she went to the office and complained about the food and told them she got tired of the junky food because nearly all the time it is rice. The officers told her there was not any other food. If she was not happy she didn't have to eat it, she could no back to her country. In Red One compound she was so cold and didn't have enough clothes. She asked the officers for more clothes but they refused. The detainees got her clothes and put them in the office, but it was several days before they were passed on. Once she was very sick and she asked the officers to see a doctor. But two male officers came to talk with her instead of a doctor, and told her that they would put her name on the Doctor's list. When you put your name on the list it lasts more than 2 weeks and sometimes more than a month before you see the doctor. In Red One Compound they bring fruit to the detainees but the officers put it in the office and drink it themselves and just give a little bit to the detainees. Cornelia would ask the detainees to give her more of this fruit juice. The officers said they kept it in the office because they were afraid if Cornelia got it she would drink all of it. The officers would lock the detainees' rooms when they went outside. They were told that Cornelia would make their rooms messy if the rooms were not locked but she was not like such a person. And the officers always try to brainwash others into thinking things about her which were not true. One of the officers called "D" told the detainees to write a letter of against Cornelia, and they should have written that she was crazy and a dangerous woman so that the officers would have an excuse to put her in the Management Unit to punish her more. But the detainees refused to do that because they liked her and she was not a dangerous person. They usually let detainees out of the locked rooms at specific times. Once when they wanted to open the doors Cornelia was having a shower. She wanted more time to finish her shower and they didn't open her door for another hour. She was really furious and was complaining about the delay. One of the officers called "D" struck her on the chest and threw her back onto the floor of her room and locked the door again. He didn't let her out of the room for the rest of the day. When you are placed in Red one Compound they increase the time you are allowed out of your room every week. Six hours in the first week and eight hours in the second week. But Cornelia's hours never exceeded 2 to 3 hours a day, but sometimes they decreased to zero for the two months she was in Red One Compound. Cornelia's room was more far away from the other rooms so that she was scared or afraid of her room because she believed that her room was spooky at night. When "D" was working at night he would bang loudly on our doors at midnight so that we couldn't sleep. When Cornelia put her clothes in the laundry for washing the officers took her bra and underpants to make fun of her. They always did it. Cornelia was also in the Management Unit, which is isolation with no windows. Just one mattress and a video camera, which can see you on the toilet. You are not allowed to turn off the light and it is always very cold and damp because there is no door on the bathroom. It is very damp. Most of the time Cornelia was crying. She said that she missed her friends and going fishing. Mr KERR (Denison) (7.13 p.m.)---Tonight I want to reflect on some of the lessons that we should learn from the Cornelia Rau episode and to put on the record in this parliament my concern about the approach that has been taken in relation to the investigation. Any person who wishes to read about those routine cruelties would be well advised to have a look at two articles on the web site magazine called New Matilda: one by Julian Burnside called 'Honesty matters: the ethics of daily life' and one called 'Talking about Cornelia' by Jack Smit. They are both in the most recent edition of New Matilda at newmatilda.com. I do not want to go through them at length, but I would commend to any member of this House and anyone listening a careful examination of those articles. We have reacted with horror to the circumstances that Cornelia Rau went through---an Australian, just like us---but her experience was repeated many times by other persons, and we did not react with such horror to those cases. Some of the things that have been happening behind those razor wire and electrified fences are akin to the kind of things that we would be critical of if they happened elsewhere in the world---akin to the kinds of things that we saw at Abu Ghraib on our television screens. That is not to say that everybody in the system is evil; our unwillingness to open our eyes to what is being done in our name is evil.